Having attended some presentations at conferences about the stress and mental health of university students, we decided on a new initiative at the Law Library. 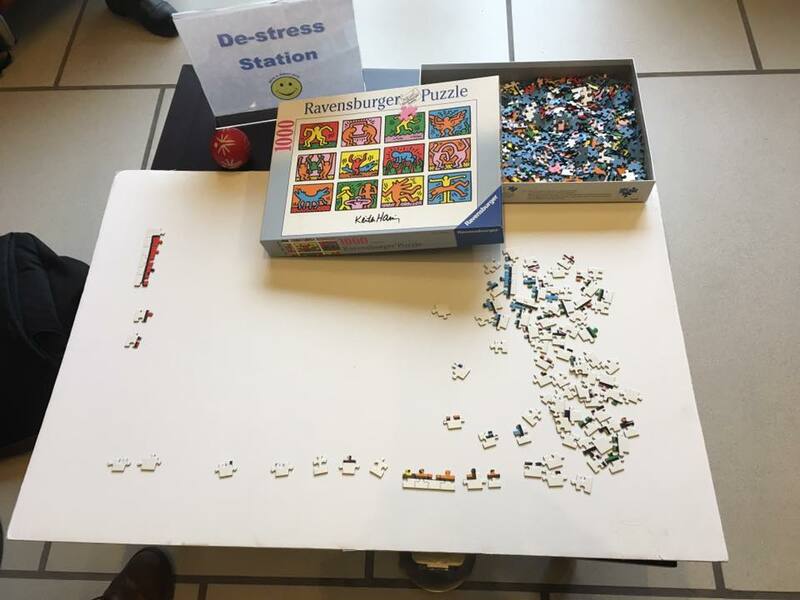 This fall semester we created a de-stress corner. 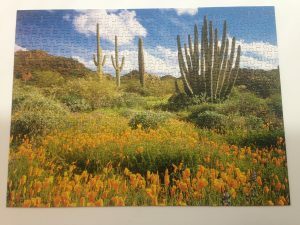 Our first puzzle of 500 pieces was done in a week! We are posting the finished puzzle images on the Law Library FaceBook page, where it has created a lot of interest. 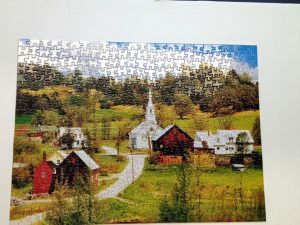 Where do you get this puzzles from? The nice staff at the Gelber Law Library brings these from home or go to a thrift shop to buy these. What do you do with them after these are done? Do you frame these? 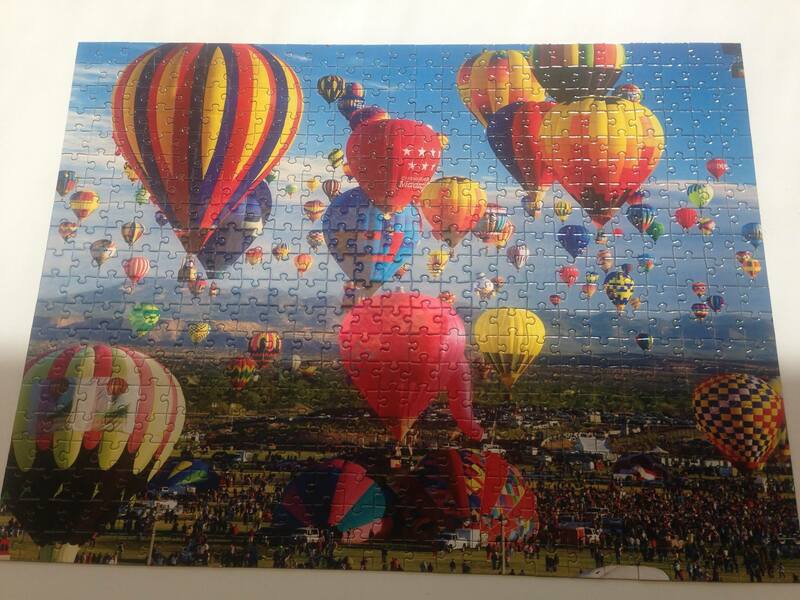 We don’t frame the puzzles. We put them back in their boxes. 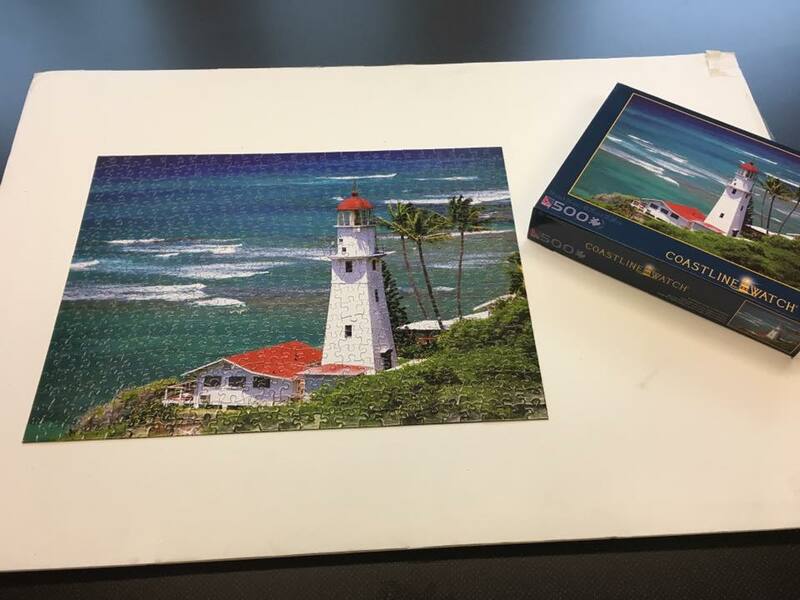 We are also sharing the puzzles with an older man in his 80’s that lives in an Old Age Home Residence who loves to do puzzles and exercise his brain. I spent an hour doing the sky and I enjoyed it very much! This is becoming a social activity and bringing us to the Library. Thank you for doing this! Our new puzzle has 1000 pieces. We all enjoyed seeing students working at it, and taking a well-deserved few minutes break from their studies. 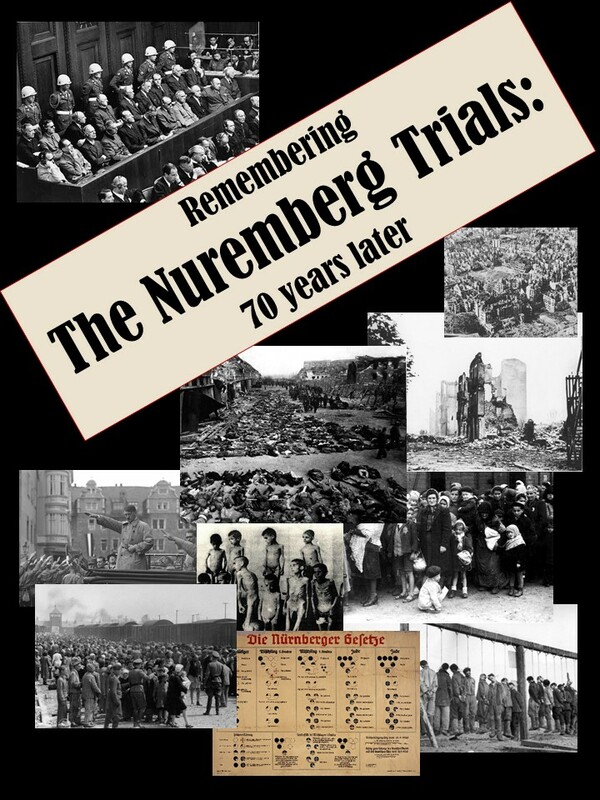 New exhibition at the Law Library is commemorating the 70th anniversary of the end of the International Military Tribunal, the most known and the most important of the Nuremberg Trials. The exhibition, curated by Sonia Smith and Svetlana Kochkina, features print materials, books, reproductions of archival documents, and visual materials illustrating Nazi crimes during the Second World War in Europe and the International Military Tribunal itself. We also have a selection of books on the subject that can be borrowed by our users (on the book truck next to the exhibition cases). The Nuremberg Trials were a series of 13 trials of accused World War II German war criminals held from 1945 to 1949 in Nuremberg, Germany. 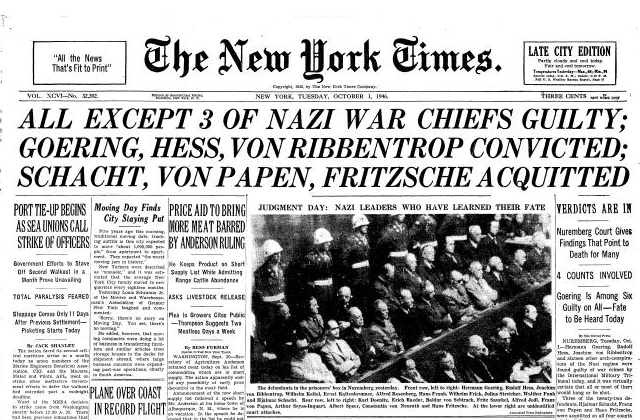 The first trial, the International Military Tribunal (IMT), held at the Nuremberg Palace of Justice, was prosecuted by the four Allied powers (Great Britain, France, United States, and USSR) against the top leadership of the Nazi regime in 1945-1946. Crimes against Peace: namely, planning, preparation, initiation or waging of a war of aggression, or a war in violation of international treaties, agreements or assurance. War Crimes: namely, violations of the laws or customs of war. Crimes against Humanity: namely, murder, extermination, enslavement, deportation, and other inhuman acts committed against any civil population, before or during the war, or persecutions on political, racial, or religious grounds. 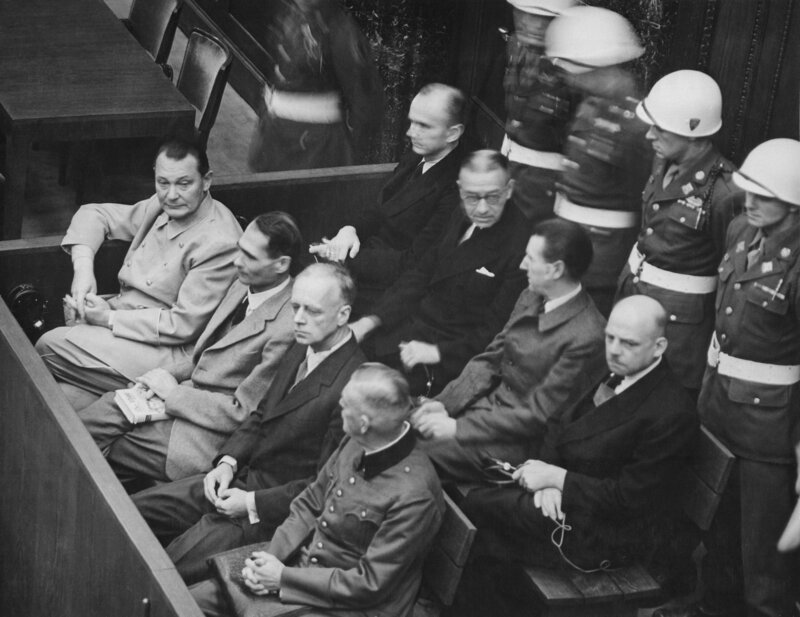 In the other twelve trials held by the United States in the Nuremberg Military Tribunals (NMT) from 1946 to 1949, a variety of Nazi governmental, military, industrial, and professional leaders were prosecuted. The post-World War II trials of German and Japanese war criminals were established to create a standard of conduct acceptable in time of war, to try cases of atrocities against humanity, and, most importantly, to document those atrocities so that a permanent historical record would be created. The American legal presence compiled a formal record of the trials consisting of captured German government records, evidentiary material, interrogations, correspondence, memoranda, briefs, and transcripts of the trials. Those involved considered it of paramount importance to preserve this documentation of the trials and of the purposes for which they were held. 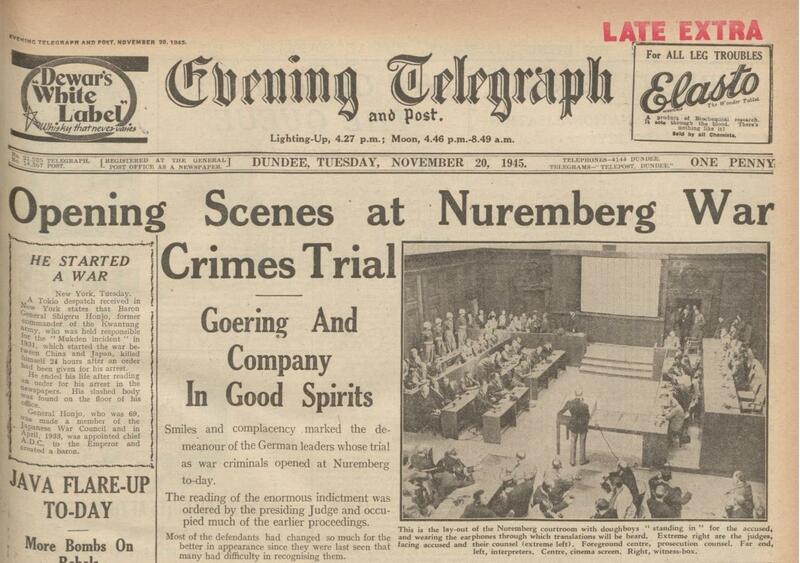 The Nuremberg Trial was an early experiment in simultaneous translation. The Charter of the International Military Tribunal stated that the defendants had the right to a fair trial, and that all proceedings be translated into a language that the defendants understood. Because of the trial’s complexities, the subject matter, and the different languages spoken by the defense, prosecution, and the judges, it was decided that using a simultaneous translation system would work best. The Second World War was the deadliest conflict in human history marked not only by the number of combat only but also by mass deaths of civilians, systematic extermination of people deemed “racially inferior”, death camps, killing of prisoners of war (POWs) on a massive scale, and use slave labor perpetrated by Nazi Germany and its allies and collaborators. The Holocaust was the systematic, bureaucratic, state-sponsored persecution and murder of 6 million Jews. Nazi authorities also targeted other groups because of their perceived “racial inferiority”: Roma, the disabled, and some of the Slavic peoples (Poles, Russians, and others), or on political, ideological, and behavioral grounds, among them Communists, Socialists, Jehovah’s Witnesses, and homosexuals. In 1933, the Jewish population of Europe stood at over nine million. By 1945, the Nazi and their collaborators killed nearly two out of every three European Jews as part of the “Final Solution,” totaling the number of death to more than 6 million men, women and children. Other victims of Nazi racial policy include some 200,000 Roma. At least 200,000 mentally or physically disabled patients, mainly Germans, living in institutional settings, were murdered in the Euthanasia Program. Close to 3 million Soviet POWs targeted as Slavic “sub-humans” were murdered or died of starvation, disease, neglect, or maltreatment. The Nazi forced into slave labor more than 7 million people from almost twenty European countries. Many workers died as a result of their living conditions with mistreatment, malnutrition, and torture being the main causes of death. Even though an exact number of casualties and victims is still unknown, the total is assessed between 40 and 50 million deaths with almost half of them civilians. The European countries that suffered the biggest losses were: Poland that lost close to 15% of its population (about 5.8 million deaths (including 300 000 military only), the USSR with about 20 – 18 million deaths (including 7 million civilians) that makes 10% of its population, and Yugoslavia, with 1.5 million deaths (75% of them civilian) or close to 8% of the population. Germany and Austria combined lost 4.4 million soldiers (with 3.5 million on the Eastern front) and close to 500 000 civilians. 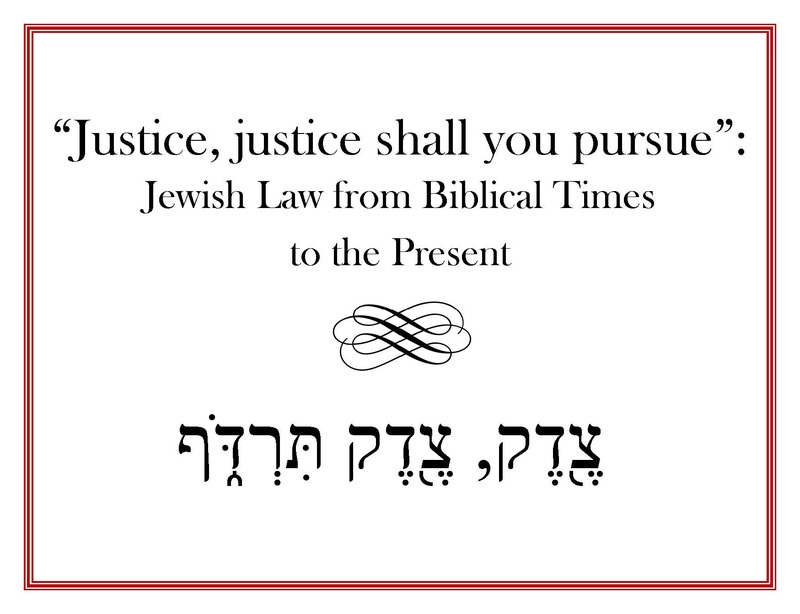 Jewish Law has a history of more than three thousand years. This extended time, can be divided in two main periods: The first broad period begins with the written Torah and ends with the completion of the Talmud. The second broad period is the post-Talmudic period, from the completion of the Talmud until our own day (Elon, Menachem. Jewish law: history, sources, principles). The Hebrew word “halakhah” is usually translated as “Jewish Law”, although a more literal translation might be “the path that one walks”. The word is derived from the Hebrew root Heh-Lamed-Kaf, meaning to go, to walk, or to travel (Encyclopaedia Judaica). 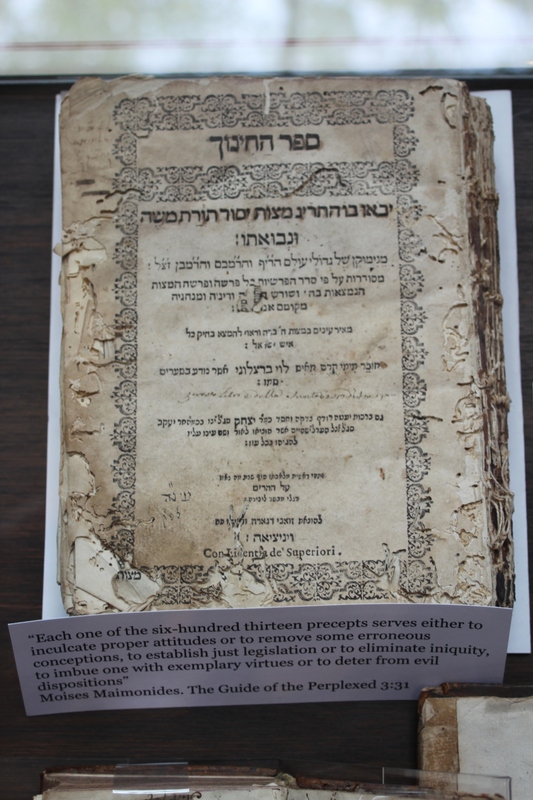 The principles and rules of Jewish Law are based on the Bible. While some rules are mentioned quite explicitly, others are only implied. All are elucidated in the teachings of the Tanna’im and Amora’im – the Rabbis of the Mishnah and Talmud – and presented systematically in the codes. Thus, over the generations, a comprehensive legal system has developed. 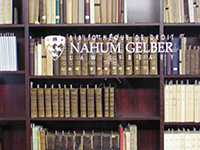 The books for this exhibition come from the holdings of the Rare Books and Special Collections, the Nahum Gelber Law Library Special Collections, and the Humanities and Social Science Library. Among the books presented we find a volume of the Ḥamishah ḥumshe Torah: ketav yad Temani. This is a facsimile edition of 390 copies of a manuscript of the Pentateuch, in accordance with the Yemenite tradition, with the Targum, Tafsir of Saʼadya Gaon and the Collecteana of R. Yaḥya Siani. A miniature Shulchan Aruch, printed in Venice, in 1574. 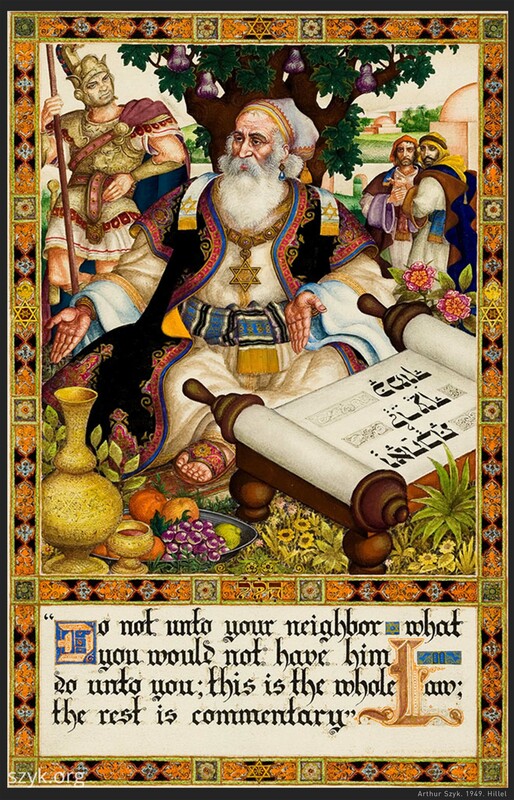 The Shulchan Aruch, or “Set Table” is a codification of Jewish law composed by Rabbi Joseph Karo in the 16th century. Together with its commentaries, it is considered the most authoritative compilation of halakha since the Talmud. The book Sefer ha-hinukh: yavo’u vo ha-613 mitsvot, yesod Torat Moshe u-nevuato, was also printed in Venice in the Jewish year 361 [1600 or 1601]. This is an anonymous work on the 613 precepts in the order of their appearance in Scripture, giving their reasons and their laws in detail. The book is mainly based on the Sefer ha-Mitzvot and the Mishneh Torah of Maimonides. 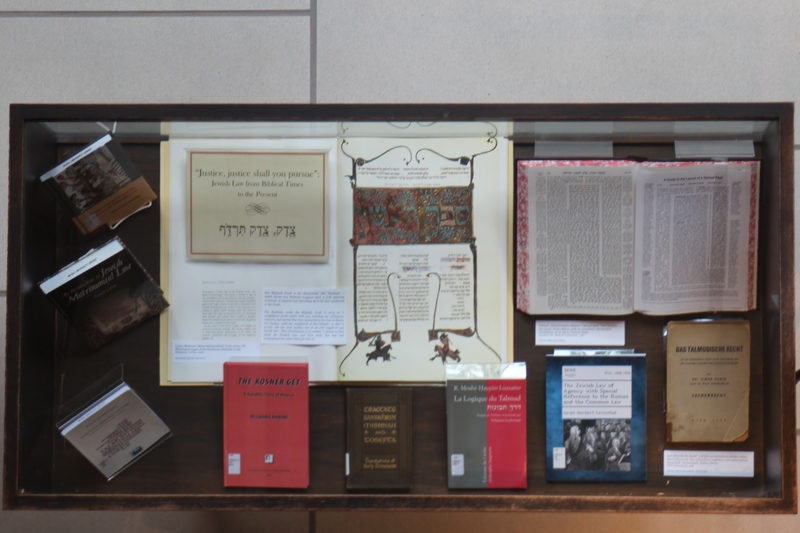 One of the centerpieces is The Codex Maimuni: Moses Maimonides’ Code of law: the illuminated pages of the Kaufmann Mishneh Torah. This book, published in 1984 reprints sixty-eight of the most beautiful pages from the illuminated codex of the Kaufmann Mishneh Torah, one of the most outstanding surviving exemplars of mediaeval Hebrew book production. A surviving example of Das talmudische Recht : auf den verschiedenen Stufen seiner Entwicklung mit dem römischen verglichen und systematisch dargestellt. Sachenrecht by S. Rubin (Wien: Druckerei-und Verlags-A.-G. Ig. Steinmann. 1938). This copy was printed in Viena, in 1938. According to a review written by W. R. Taylor, the author has planned a study of Talmudic law to be embraced in three volumes. The purpose of the project, according to Taylor, was to bring the Talmudic legislation into a scientific arrangement in harmony with modern methods and to institute a comparison of the Talmudic material with the relative parts of Roman law. At the end of each chapter there are extensive notes inclusive of references, citations, and expositions of maxims from the Talmud and the later codes of Maimonides, Asher, and Karo, and from Roman law. Ioannis Seldeni, De synedriis & praefecturis juridicis veterum Ebraeorum. Londini: Typis Jacobi Flesher: Prostant apud Cornelium Bee …, 1650-1655. John Selden, 1584-1654, was an English jurist and a scholar of England’s ancient laws and constitution and a scholar of Jewish law. In 1650 Selden began to print the trilogy he planned on the Sanhedrin, the assembly of sages that constituted the highest political magistracy of the country. 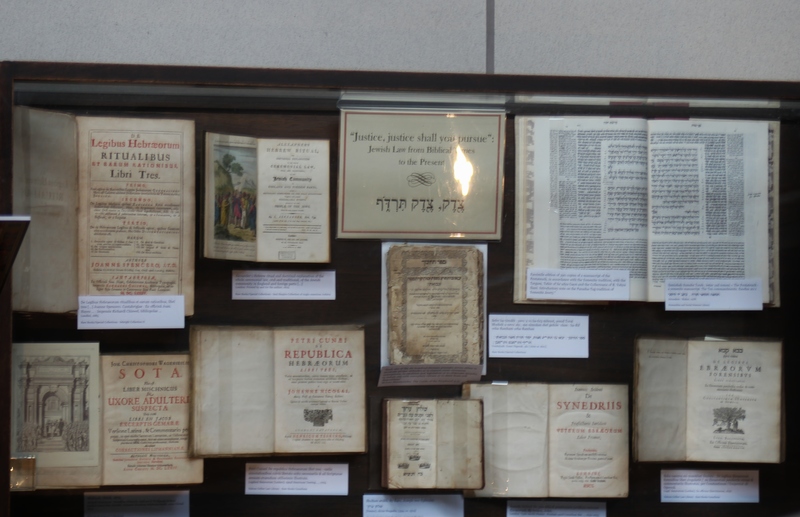 This exhibition was planned and organized by Sonia Smith and Svetlana Kochkina, librarians at the Nahum Gelber law Library.